Surge protector is designed to protect electronic equipment against surges, spikes and line noise. Design accommodates bulky transformers without blocking remaining outlets. LEDs warn of potential power problems. Lighted power switch with integrated 15 amp circuit breaker offers power control and overload protection. 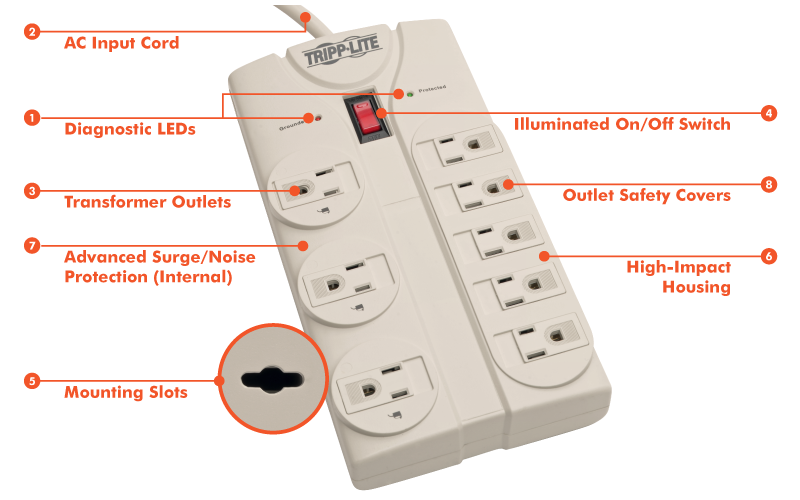 Surge protector also features 8 outlets, an 8' cord with space-saving angle plug, and integrated child-safety sliding outlet covers. 1440 joules AC surge suppression shields equipment from the strongest surges and line noise. 1440-joule surge protection rating – More joules mean more protection!